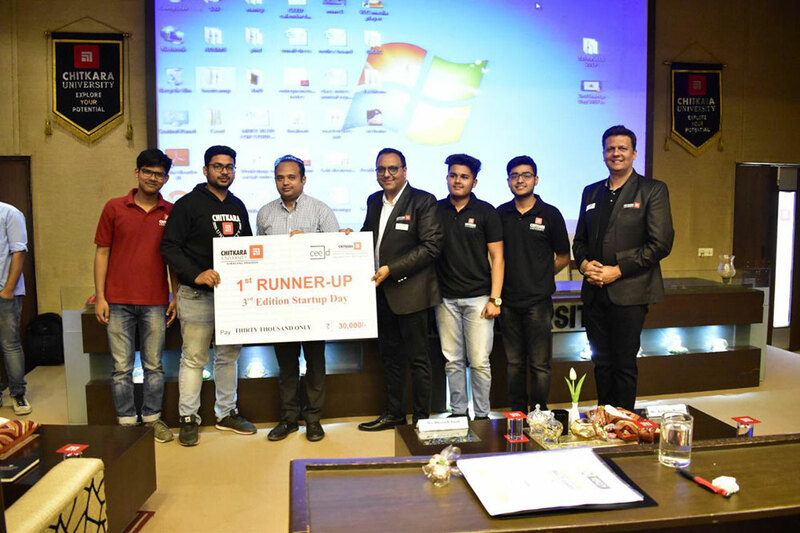 Chitkara University awarded three student startups at its 3rd Startup Day, a student accelerator program, with a grant of Rs 1 Lakh to build their early stage business ideas. Dr. Archana Mantri, Pro-Vice Chancellor, CURIN; Mr. Bhavish Sood, Partner, Blue Sky Capital Partners; and Mr. Himanshu Sharma, Director HR, Chitkara University; were the jury members for the day. ‘Choco Library’, a startup into gifting customized chocolate boxes targeting corporates, individuals, wedding planners for occasion gifting, bagged the first prize; followed by ‘The Salvators’, a startup into building bio-plastics from waste potatoes and retailing products like water bottles, carry bags, small bins, disposable crockery, with the second prize. The third prize went to ‘Smart Ignition’, a startup into manufacturing of a special lock for preventing two-wheeler theft. All the three winners were presented with a grant of Rs 1 Lakh to build their early stage business ideas. The next step for the first year students now is to go into a structured mentoring and acceleration program by CEED and start building their scaling up avenues.